I'm continuing on my "vegan cream pie" blitz with this double layered peanut butter-infused cream pie. Tofu-based. Oh so yummy. If you love enjoying dessert at all hours of the day - then these "healthy" vegan breakfast ideas will get you quite giddy. Be a kid and eat dessert first! First thing in the morning.. This kids-approved after-school snack takes all the fun of a peanut butter sandwich and adds layers of fun fave fruit! It's like peanut butter toast with a side of fruit - thinly sliced apples and banana here. Maple and cinnamon too. This is an easy weekday hot lunch. Creamy coconut rice is the perfect accent to pan-fried veggie wontons. Add some sweet and sour dipping sauce on the side. Give your immune system a boost with this citrus frosty - infused with the spicy sweet flavors of ginger and grapefruit. Plenty of vitamin C! You may already have a vegan chili recipe up your sleeve - but this post is great to pass on to a friend who may be curious about vegan cooking - and also love chili! A few simple substitutions and you can veganize pretty much any chili recipe! Fun post highlighting some super cool markets around the world. For all the worldly Farmer's Market fans out there. Paris, Hawaii and more..
Banana Bread (and pumpkins) remind me of a cozy fall morning. So here are a few recipes that are banana bread inspired. From waffles and quinoa cereal to muffins and shakes - get your banana bread fix a few creative ways. * 8/15 - vegan jello, sunny pesto pasta, peachy "A" Smoothie, creamy cole slaw recipes, vegan sloppy joes, apricot cobbler and lime basil sorbet! * 8/8 - jumbo croutons, fresh tomato hummus, peanut butter pillows, veggie burger slideshow, sticky maple french toast, cinna-rolls and more! * 8/1 - hazelnut hummus, pesto pasta, tofu scramble, squash blossoms, savory waffles, hash browns. * 7/25 - smoothies, vegan burrito, blueberry bread, panzanella salad, beet salad, peach crisp. 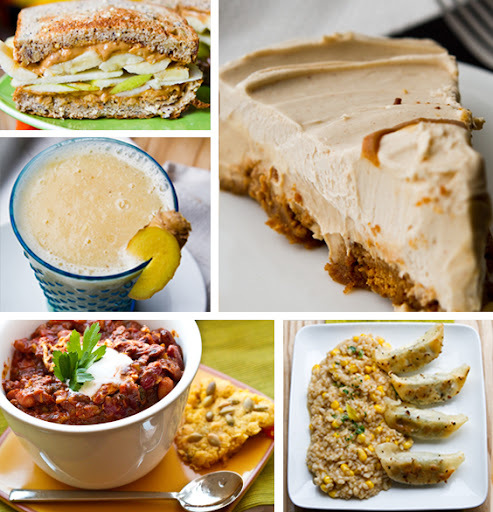 * 7/18 - roasted pepper hummus, raw food eats, papaya smoothie, owl cake, chocolate pudding parfait, hemp mashed potatoes and watermelon recipes.